As much as I hate to take away a championship from Coach Saban, I have to because USC and their talented team were the real deal and had one slip up. That slip up? Against Cal on the road, their QB? Oh yeah, Cal put Aaron Rodgers on the field that day (Side Note: the next year Rodgers went 23/24 in an upset bid against #1 USC, the only incompletion? A drop in the end zone at the end of the game). I would say that is a pretty good team. Oklahoma, the preseason number 1, was the odds on favorite heading into the conference championship weekend, and they had been so dominate that the press was squawking that OU could lose the Kansas State and still be in. Well, the press corp backed that up when Kansas State took OU to the rack by blowing them out and they still put OU at number 1. The team that got screwed in all of this BCS turmoil was the USC Trojans, who had two future Heisman winners in the backfield. They put together a great year that including embarrassing the Cow School at Jordan-Hare. LSU ran the gauntlet of the SEC and their lone slip up was to Florida, who wasn’t exactly a cupcake, so they deserved to be there too. The only team out of the three that didn’t seem to belong was OU, but for some reason it was never in doubt that they would be playing for the title. This is one of the key years of the BCS that proved that we did need some sort of playoff. First, USC, LSU, and Oklahoma all had legit claims to at least playing for the title. 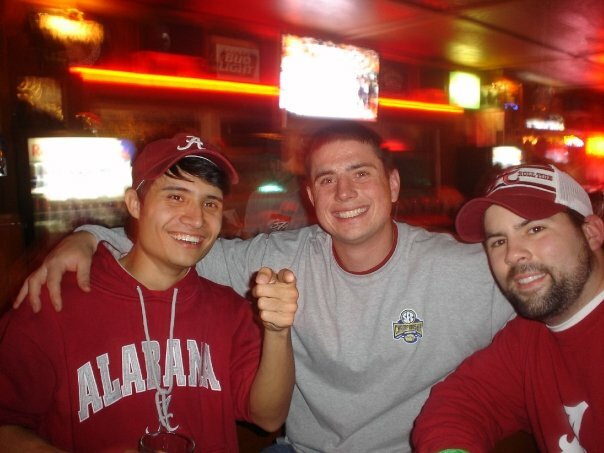 Second, we had a split title between LSU(BCS) and USC (AP) which was supposed to be solved with the cabal of BCS bowls got together to ‘solve’ our college football championship problem. I have been a fan of the four team playoff because the #3 team usually has a pretty good case for playing for the championship, but the #5 team’s case is never very strong (with respect to the epic 2007 season). 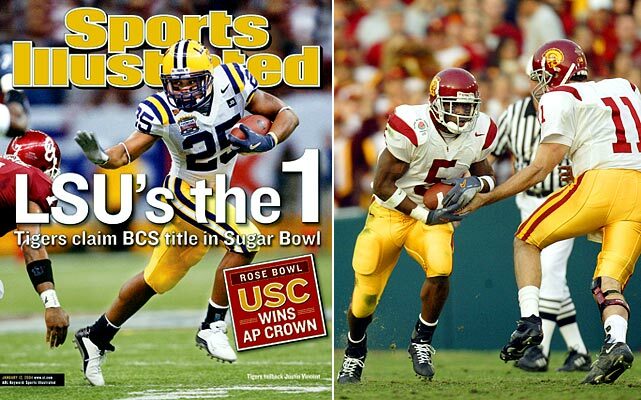 In the end, USC beats LSU in the battle of the ‘split’ National Champions. 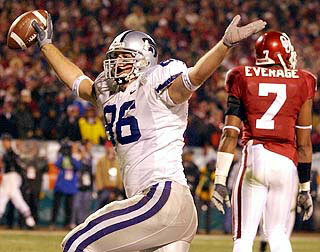 OU beats Michigan, maybe, and gets smoked by USC just like they did in real life in 2004. Wait, there two star players (Leinart and Bush) are going to be around for two more years? Is this like Miami all over again?